Chances are, if two-thirds of your outfit are a songwriting duo who have worked with the likes of Madonna, Britney Spears and Katy Perry, then you’re bound to hit some form of success. With Miike Snow, a collective consisting of producing duo Bloodshy & Avant along with singer Andrew Wyatt, who himself is no stranger to working with those who are unreachable by us mere mortals, notably Bruno Mars and his 2011 hit ‘Grenades’, we have all the ingredients for success. Naturally with these two forces ultimately joining up to create music, something was bound to stick, and stick it has. Now on their third album, ‘iii’, Miike Snow show no sign of slowing down or loosening their metaphorical grip upon the indie/alternative dance world. ‘iii’ is a positively charged cycle of lustful and longing songs that will no doubt make various remix appearances around numerous clubs this summer. 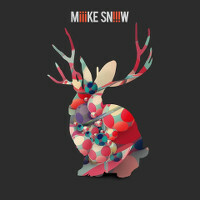 Opener ‘My Trigger’ is a piano-led upbeat number that perfectly sums up the approach of Miike Snow to songwriting, that being quantity over quality. Lyrically, the song is very weak, as are most of the lyrics on the record, with the highlight of this track coming from the line, “I’m in the graveyard, if looks could kill”. All style, no substance: not necessarily a bad thing, but unforgettable this maketh not. The trouble with a group of producers/songwriters is that they tend to miss the flair and personality of an actual artist. We’re not so naive as to believe every single song in the charts currently was written by one singular, talented soul (there are obvious exceptions). There is always a crack team consisting of multiple movers and shakers who each has their own rhyming dictionary. But when you remove the artist, the body that brings some form of tangible life to the songs, it becomes a bit of a backing track almost, where you’re left waiting for the heartbeat to start. For instance, with the latest single from the album, ‘Genghis Khan’, the foundations are certainly there. The music ticks all of the right boxes, a nice blending of vocal layering and low piano parts create a perfect storm. Once again though, lyrically, there are moments that stick but generally it becomes a bit throwaway. The song itself takes the perspective of two men who are chasing the same girl, with their own selfish motives, seemingly something that is found quite often in this millennial-driven world. We want everything now, even things that aren’t ours. As a song about selfishness, it’s quite pleasing. ‘For U’, which features Charli XCX, is structurally very unsound. It feels more of an explosion of ideas rather than a careful melding. Her guest vocal is a pleasant break from the effects that Wyatt’s vocals are put through for the first half of the verses, which feel a bit unnecessary and just distract from the song itself. The entire album relies heavily upon repetition – something almost expected in music – but to the extent where every song becomes lodged in your head makes it had to discern exactly which ones are ok and those that are just annoying. ‘Over & Over’ has the most focused instrumentation, with a sharp distorted guitar riff kicking it off, leading into brooding and whispered vocals. It builds into a crescendo that isn’t completely pleasing, but resolving enough to leave you feeling as if you’ve heard something worthwhile. At this point, it’s easier to give a brief summary of an album that, although it is pleasing, in the same way a One Direction greatest hits album would be. It’s very paint-by-numbers in both sound and lyrical content, proving that although certainly the people behind the songs are important, you can’t remove the personality and expect it to have the same impact. ‘iii’ is out now via Downtown / Atlantic Records. For our past TGTF coverage on Miike Snow, head this way.